Nail and tanning salons are in fierce competition across the country. For that reason, many establishments focus on impressing their clients with an amazing experience. You can help foster a sense of excitement and luxury by purchasing colored salon hand towels that are perfectly suited and sized for your particular needs. When you need bulk colored cotton hand towels for your salon, spa, team or business, Towel Super Center is here to help. 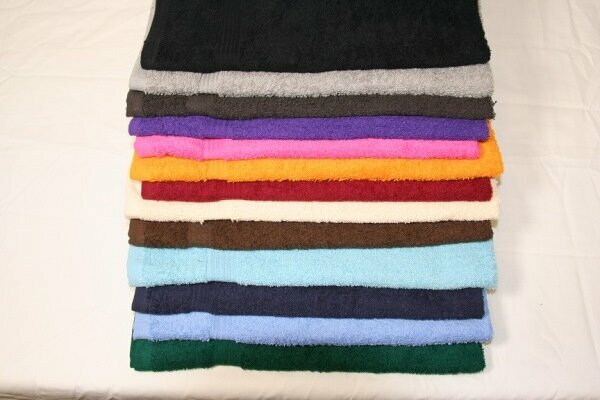 We have a wide selection of colored cotton hand towels in generous 16x27 sizing that’s perfect for your business. You want soft and durable colored salon towels at low prices, delivered quickly and reliably. When you shop at Towel Super Center, you’ll join customers that depend on our reliable service and durable products. When you choose Towel Super Center for your wholesale hand towel needs, you’ll also get the selection, price and quality you need and expect to keep your business running smoothly. What's the secret to keeping your colored salon hand towels performing day after day without showing signs of wear? In addition to buying the best, 100-percent cotton varieties from Towel Super Center, you should always maintain a consistent laundering routine. Avoid using any bleach products, but feel free to try bleach alternatives to help lift stains and odors from the towel fibers. Also, be sure to wash and dry your colored salon hand towels on a daily basis. The less time they sit while damp, the fresher they'll look and smell when you're ready to use them. Shop Towel Super Center for low prices on large colored hand towels today!